The disheartening but well-told account of a grisly 1991 factory fire that exemplifies the social costs of institutional racism and “cheap” capitalism. Simon (History/Temple Univ. ; Everything but the Coffee: Learning about America from Starbucks, 2009, etc.) uses the forgotten flashpoint of the Imperial Food Products fire in Hamlet, North Carolina, in which 25 people died, to synthesize an unsettling argument about an insidious “social gospel of cheap” that has overtaken American life since the economic jolts of the 1970s. “This was a serious, and perhaps purposeful, side effect of the business-first policies that had flipped the New Deal and Fordism on their heads,” he writes. In Hamlet, a relentlessly pro-business attitude allowed the factory to maintain an unsafe, grueling workplace for people with few prospects; the fire victims included African-American single mothers and white working-class people whose own prospects had diminished with the disappearance of stable railroad and industrial jobs. 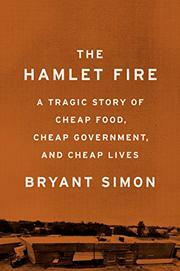 Simon incorporates a broader regional history that reveals how such towns became dependent on the “brutally competitive business…of fast food products.” He illustrates this with a stomach-churning narrative of the historical transformation of chicken into a cheaply produced, unhealthy foodstuff, farmed out to individual contractors treated like sharecroppers and middlemen like Imperial with little oversight. These processes were accelerated by the revived Southern antipathy toward unions and long-running racial tensions; during the blaze, a black township’s fire department was kept on standby, confirming a sense of racial bitterness layered on top of class stratification. “Hamlet’s racial geography only added to the already festering distrust that, in turn, exacerbated PTSD symptoms,” writes Simon. Despite the temporal distance, Simon creates in-depth characterizations, ranging from Imperial’s owners, portrayed as callous out-of-towners who kept factory doors locked to reduce theft, to compromised local officials to desperate workers who barely survived. He conveys this sad tale via admirable research and a clear voice that only occasionally becomes didactic. A vivid, highly disturbing narrative with relevance to current discussions of economic inequality and workplace safety.